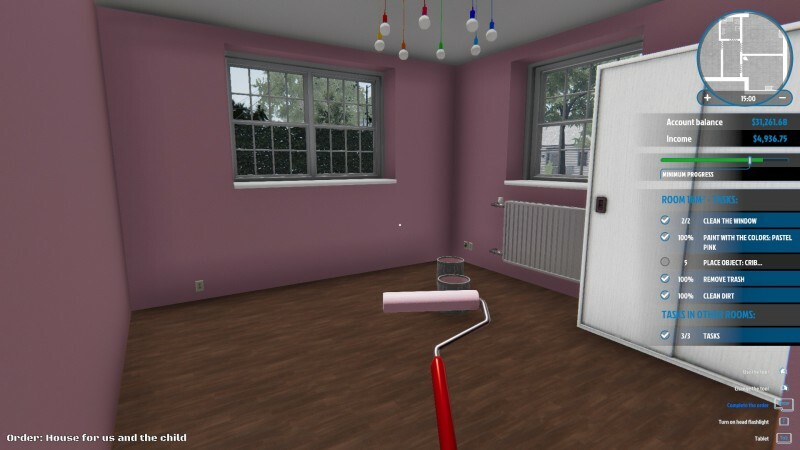 In the realm of incredibly niche sim games, House Flipper certainly feels like a no-brainer. The concept of buying run-down houses, improving them, and then selling for a tidy profit has spawned countless television series, and makes for an enticing gameplay loop. 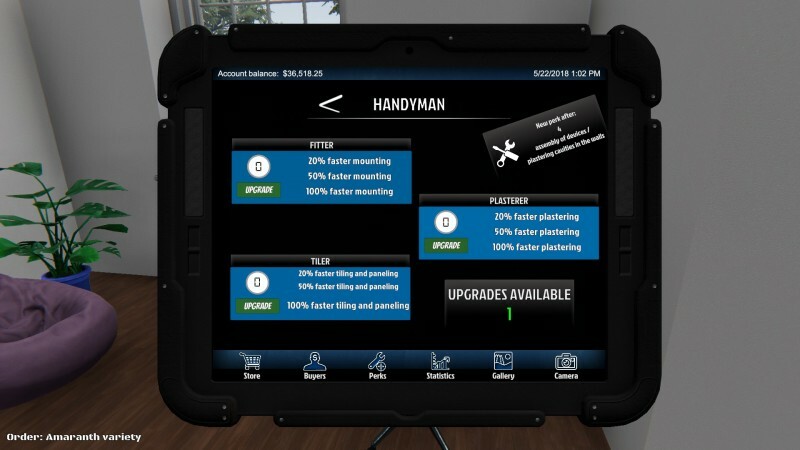 Unfortunately, House Flipper has its own list of vital improvements that need addressing if it hopes to satisfy would-be interior designers. 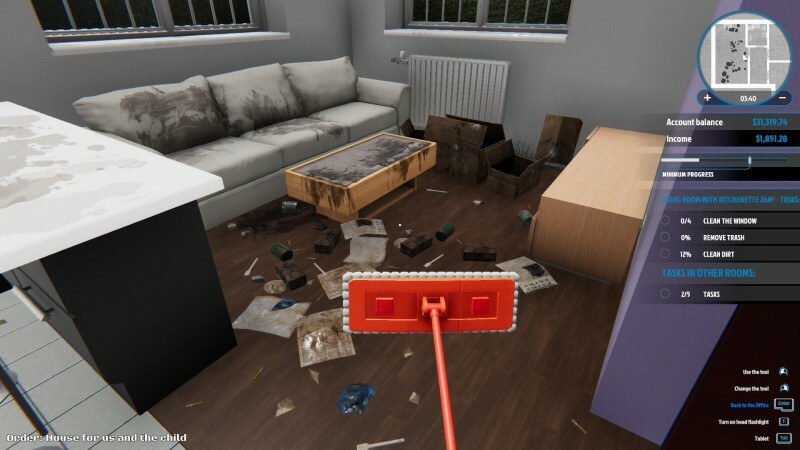 Players start from humble beginnings in House Flipper, performing simple cleaning jobs for clients to earn cash for their first home purchase. These missions serve double duty as a lengthy tutorial, and the sense of progression is handled nicely; not only do you gradually acquire the different tools you’ll be using to improve homes, you also start unlocking a variety of quirky perks, like consuming less paint or the ability to identify dirt on your mini-map. 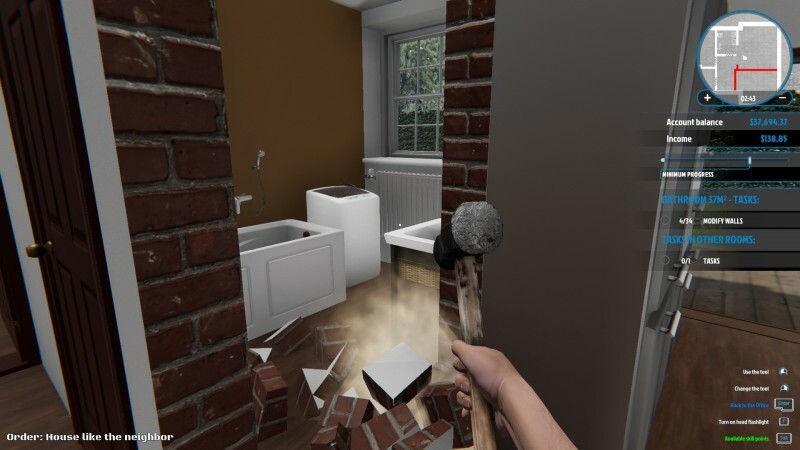 House Flipper gives you the ability to perform a number of remodeling actions, but the actual gameplay mechanics aren’t very interesting. Cleaning boils down to clicking on boxes and other litter to make it instantly vanish, or holding in the mouse button to wave your broom in the general vicinity of stains. The mechanics for painting, tiling, and mounting appliances are equally simplistic, and don’t leave much room for creativity. You have a little more freedom when it comes to demolishing and building walls and placing furnishings, but you won’t be impressing Chip and Joanna Gaines anytime soon. After you’ve saved up enough money, you can forgo the set jobs and buy your own fixer-upper on the open market. The houses come in a variety of different sizes, prices, and levels of disrepair. After following the lengthy to-do lists of your previous employers, having the ability to do whatever you please with your new home is exciting. However, it doesn’t take long to realize your renovation options are less expansive than they first appear. 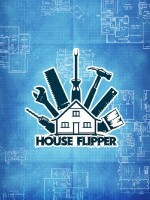 I’m not the biggest remodeling show fan, but thanks to my wife’s obsession with HGTV, I’ve watched enough of them to understand the appeal, and House Flipper simply lacks the flexibility to deliver on the dream. Despite the real-world emphasis on curb appeal when it comes to selling homes, you can’t perform any landscaping or outdoor improvements to your houses aside from applying a new coat of paint. You also can’t add or remove windows, or alter outside walls in any way. The demolition mechanics are limited inside as well; you can’t tear down or move any wall that has plumbing fittings, so your bathroom layouts are bound to stay static – unless you want a toilet in your kitchen. These restrictions put major renovations out of the realm of possibility and make the whole experience feel shallow. Even if you’re happy with your home’s floorplan, touching up rooms lacks flexibility. Paint is applied one full-length, vertical strip at a time, preventing you from doing any kind of creative treatment aside from big-top circus stripes. Your color options are also underwhelming, and you can’t mix your own custom hues. 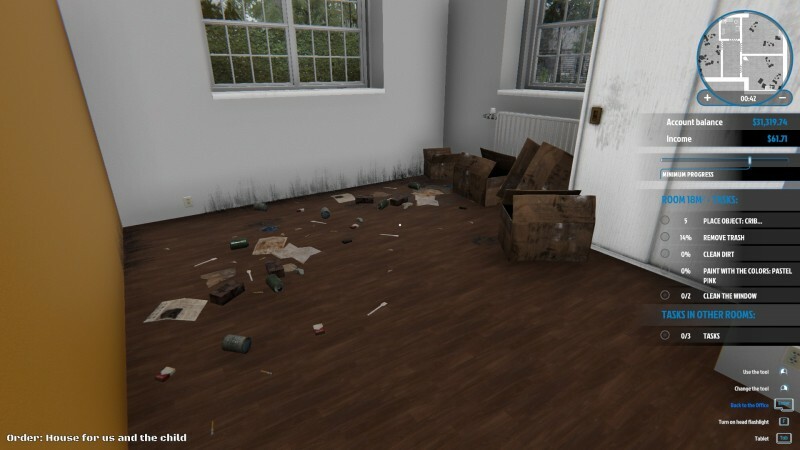 While House Flipper technically boasts hundreds of unique objects that you can place in your homes, drilling down into specific categories sometimes offers depressingly few options. You quickly get tired of placing the same doors, desks, and (one!) shower in all of your homes. Putting up shelves often left me at a loss for what to fill them with, and I found myself gravitating to the same few candles and plants to make rooms feel less barren. 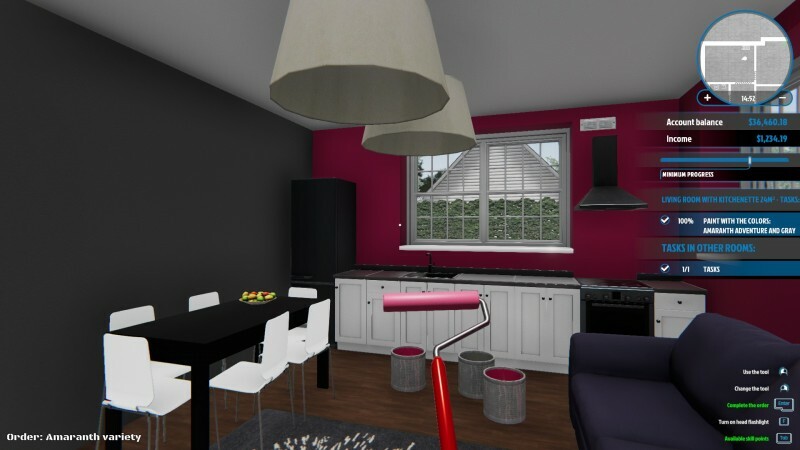 While House Flipper’s tools are serviceable, you won’t be able to truly design your dream home, or incorporate your own creative flourishes beyond the ability to add custom paintings (which I had way too much fun with). This limited creativity isn’t a deal-breaker, but it results in generic homes, which makes the renovation process feel repetitive. Fixing up homes is only half of the house-flipping loop – you also have to sell them. Here too House Flipper offers an abbreviated and less-than-realistic simulation of the housing market. Once you’re satisfied (i.e. can live) with your renovations, your home instantly goes to an auction to see which of a dozen dedicated buyers place the highest bid. These buyers are presented as typical would-be home owners – a business man, an elderly couple, a few families – but will continue buying up your future homes no matter how many they own. Each buyer also has personal tastes that you uncover through the auctions, but their guidance is nebulous and sometimes downright contradictory. During one auction a buyer commented that “the whole house is clean, very nice” – only it was listed in red as a dislike. Even when buyers are clear about what they want, delivering can be difficult because the requirements for what registers a room as a specific space aren’t listed in the game. I tried catering to one couple by including a massive family room in one home, complete with a comfy sofa, entertainment stand, television, and bookcase – but apparently because the room didn’t have curtains or a speaker, it didn’t count as a family room. Ultimately, the wants of individual buyers don’t really matter much anyway. When I failed to entice the single businessman with a one-room home because it lacked a separate office (which I totally included! ), a different family bought it anyway – even though the home lacked the extra bedroom and playroom they were looking for. Not once did I fail to turn a profit on a sale, which once again undermines the renovation loop – why spend more of your budget on extra furnishings that the buyers don’t really care about, when you’re virtually guaranteed a profit no matter what you do? After your first few sales, House Flipper falls into a boring and repetitive rut: Buy a house; clean, plaster, and paint; add a few pieces of furniture, then sell and repeat. Aside from the initial price tag for a house, money isn’t an issue – you have no ongoing expenses, and are in no danger of not finding a buyer, so there’s no risk or tension involved in getting a job done or making a sale. 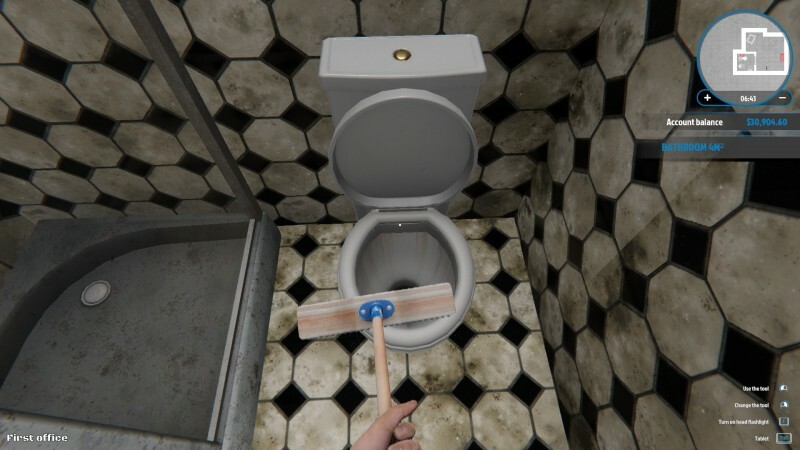 House Flipper seems like a killer idea for a sim game, and while your first few sales deliver some of the before-and-after magic, the game fails to capture the larger remodeling fantasy. 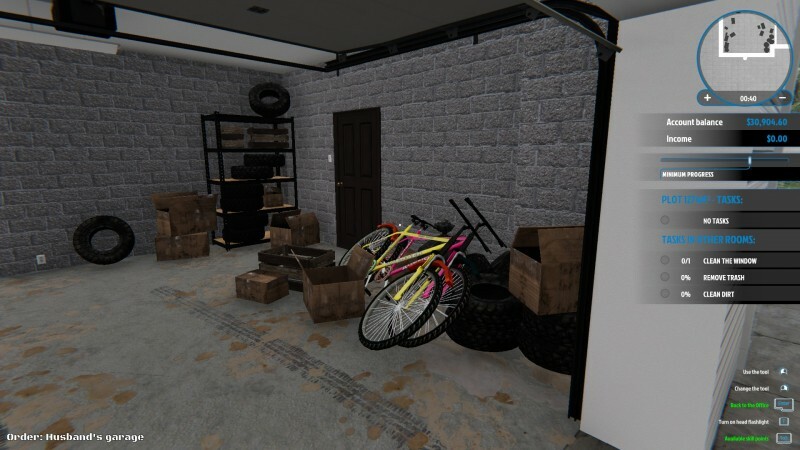 Empyrean has been delivering a steady stream of updates and improvements to House Flipper, but it’ll take a lot more elbow grease to get this fixer-upper ready for market. 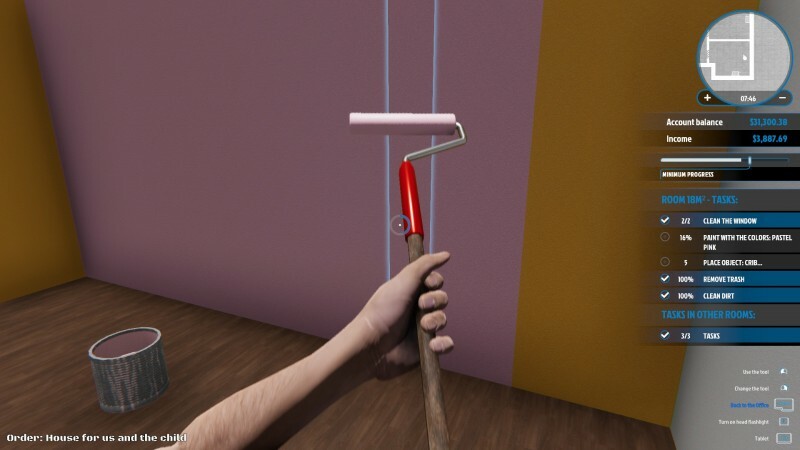 House Flipper has its own list of vital improvements that need addressing if it hopes to satisfy would-be interior designers.